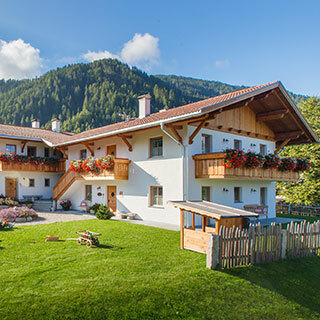 Our apartments are in the south of the Val Pusteria, a little above Santo Stefano (950 m above sea level) and offer a clear view of the entire chain of the Ötztal and Zillertal Alps. We offer four comfortable holiday apartments, each of which features old wood and has been individually furnished with attention to detail. 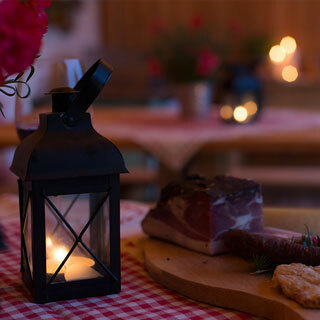 The Messner Bauernstube in the centre of Santo Stefano serves traditional South Tyrolean specialities and is popular with both visitors and locals. The tributary valleys of the Val Pusteria - the Gadertal and the Valli di Tures e Aurina - offer countless hiking options, while the Plan de Corones ski resort (1 km away) provides plenty of opportunities to enjoy wintersports. Enjoy your holiday on our peaceful farm and a fantastic view of the surrounding mountains. 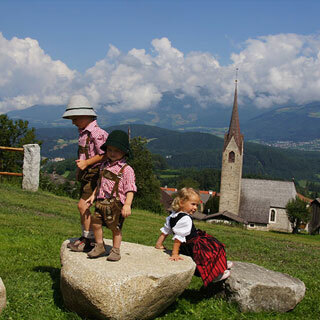 South Tyrol offers a wide range of things to do on your summer holiday. Stefansdorf lies between the Dolomites and the main Alpine ridge, which includes the Zillertal and Ötztal Alps. There is therefore a huge range of hiking options. The main attraction in winter is certainly the famous Kronplatz, South Tyrol's No. 1 ski mountain. You will find a perfectly groomed toboggan run near the Korer lift.